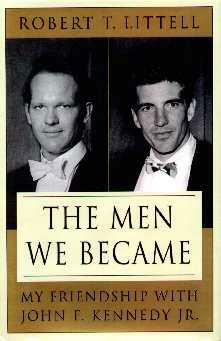 The Men We Became - My Friendship with John F. Kennedy Jr.
John F. Kennedy Jr.'s life has been chronicled from the time be was born, both in photographs and text, and it doesn't look as though it's going to stop, even though he left us tragically six years ago. This is a book by his good friend Robert Littell and starts off with their initial meeting at Brown University. It seems it was an instant friendship and one to stand the test of time. It couldn't have been easy with John being as famous as he was, or as attractive, but Littell somehow seemed to accept John, warts and all. These adventures of young students, on and off campus, travelling to Europe, sports and more, are a personal insight to John's privacy, and there are also some snippets of Jackie Kennedy Onassis' very private life. Not only was Robert privy to the inside of 1040 Fifth Avenue, he was also invited to meals there with many famous and influential people. Littell tells about their time in Providence, RI and briefly of their friendship with the now famous Christiane Amanpour, the increasing press attention, their move to New York, their social life, John's magazine George, their escapades on Martha's Vineyard, John's piloting, his girlfriends, and much more. After reading this book, all those pictures in the newspapers and magazines somehow make more sense. Littell doesn't "cash in" on his friend's legacy, he simply tells it like it was. There is no gossip and Littell's account is believable - it all makes sense. A great tribute to his dear friend. Conclusion - Interesting and a very nice read.